Kirby Naiads are well known as rigid inflatables with aluminium hulls that are built like ships. This week’s Naiad under review is something different: it has a pressed aluminium bottom, and the chief reason for this is weight reduction. There are owners of large vessels who want to be able to carry their tender on board, particularly if they are travelling long distances, but have limits on how much weight they can hoist. There are also people who want a Naiad that they can tow effortlessly on the road – or off road. Sometimes they are the same people, leaving the big boat in Fremantle and towing the tender north. Kirby made the huge investment in the machinery that presses the shape and the stiffening longitudinal ridges into the bottoms of their lighter boats. This 5.8 metre Naiad is the largest to use the technique, which certainly produces a light boat. With a 115hp Yamaha on the back weight is 925kg. The standard deadrise for Naiads is 23 degrees; the 5.8’s is 18. The reason is if the lighter hull were teamed with the steeper deadrise the chines would be out of the water at rest without plenty of weight on board. It would be a twitchy boat. The buoyant collar is not called on to do any of the overall weight saving. It is constructed in the identical material used by the largest Naiads: heavy duty special fibre reinforcing the high grade polyurethane, panels of which are welded rather than glued. This is military specification grade. A tough bonded-on fender band completes the package. Compared with most rigid inflatables around this size the 5.8 has an exceptional deck area, one of the properties most sought after in tenders. This is aided by an uncluttered fit out and a centre console deliberately scaled down. This has been given a bolster rather than a seat, which fits most people’s preference anyway, but room has been made for some storage below it. There is not a lot of storage on board: besides the bolster locker the console is almost all that is available. Two of the transom lockers house the twin batteries linked by a tricky switching system, leaving just one for general use. The deck is self-draining and not pierced by locker lids. Between deck and bottom the cavities are foam filled making the hull, even without the collar, positively buoyant. The deck is coated with SeaDek, a non-absorbent plastic material that is highly resistant to abrasion from the likes of sand, and is pleasant underfoot. The console has a small, very tough windscreen and houses the basic electronics of an ICOM VHF plus a Raymarine sounder-plotter combo. One likeable item at the console is the wheel. In stainless steel, it is equipped with a knob. All wheels should be. Tenders do a lot of coming alongside, a manoeuvre that requires a lot of wheel turning at the same time as throttle and gear moving. One hand for the lever leaves one for the wheel, which needs two – unless it has a knob. Unlike most of the larger Naiads this one has just a basic anchoring system, which does the job with the minimum of added weight. The heavyweight item in the vicinity is the tow post, well able to cope with heavy loadings in rough seas. Precisely what a tender needs. 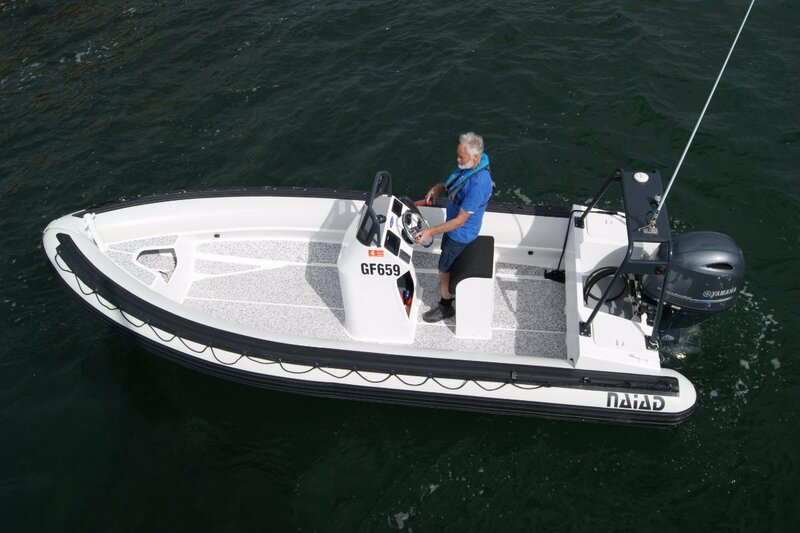 115hp might seem on the generous side for this size and weight of boat, but bearing in mind the loads a tender is often called on to carry it makes good sense. On test the 5.8 had five passengers on board and leapt onto the plane. Where abundant power is especially handy is when running home in a big following or quartering sea. 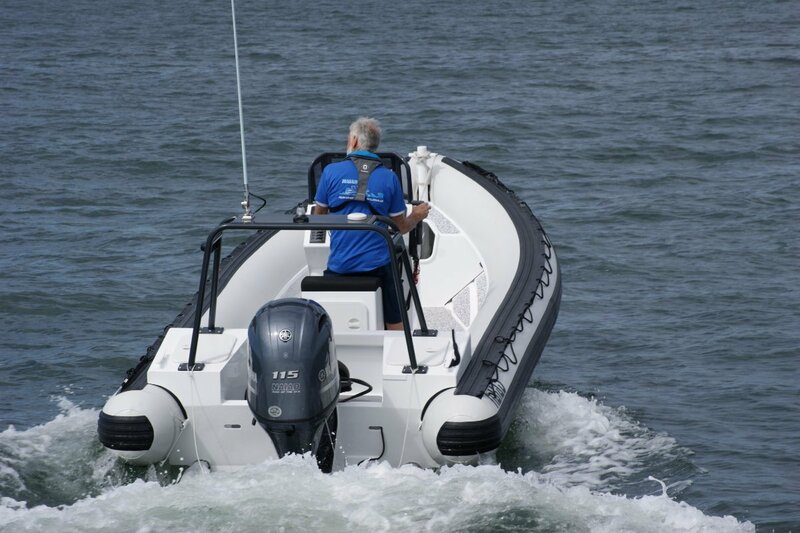 Instead of constantly having to vary the throttle opening as the boat slows and speeds up, the available power allows pretty much a constant throttle setting. With those five passengers on board maximum speed was in the mid 40s, meaning a lot of power in reserve at cruising speed.